Staffing – After 15 years at Gairloch High School Mr Hugh Conway has departed for a new job at Nairn Academy. We wish him well and thank him for his contribution to the school community during his time at Gairloch. P7 Induction Days – On the 10th & 11th June P7 pupils attended for the final part of their induction to High School. At the end of the two days the children received their school ties, which we hope they will wear with pride after the holidays. Pupil Success – The following pupils have been selected at Regional level on the basis of skill and effort. Very well done! 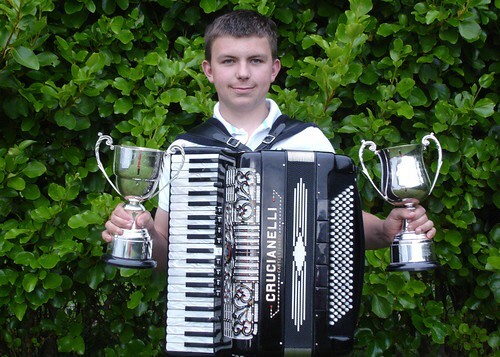 In addition, Alasdair Paul has had a successful audition for the Fèis Rois Ceilidh Trail, and will be playing as part of that group all over the Region during the summer holidays. “C for Craic” – Our folk group consists of Alasdair Paul (guitar), Sophie Donald (violin, guitar), Ella McDonagh (accordion), Conal McDonagh (pipes, whistle), Ross MacDonald (accordion), Mags Matheson (violin) and is led by our tireless strings instructor Rhona Sutherland. The group will be making an hour-long appearance on the Ross Bandstand in Princes Street Gardens during the Edinburgh Festival – on Monday 9th August between 10am and 12.15pm (to be confirmed). We wish them all the very best! Sofie Banister (S1) has qualified for Blair International Horse Trials and took the In-Hand Championship at Mundole and at the Caledonian Spring Show recently. She has also come in the top 6 in the Show Hunter Pony Class, which covers Scotland and the North of England. Well-done Sofie! Rhoda Tippett and Conor Easby took part in the recent charity 10K from Strath to Sand Camp Site and back. Well done both! 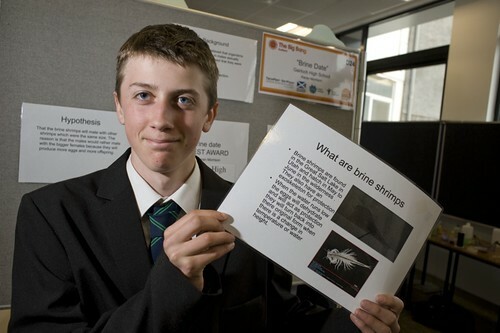 Big Bang Festival of Science – Earlier in the year, Kieran Morrison (S3) received his CREST (Creativity and Research in Science Engineering and Technology) Award for working on “Brine Date” – the mating preferences of brine shrimps, inspired by Charles Darwin’s theory of sexual selection. As a result of his work, he was invited to the Big Bang Festival of Science at the University of Abertay earlier this month to present his findings. Kieran had a fascinating day and represented the school magnificently well. Enterprise Event – S4 pupils were involved in a variation of ‘Junior Apprentice’, recently broadcast on BBC1, for two days of their Enterprise Week. Four teams were set the task of coming up with a new piece of camping equipment, just as contestants on the television programme were required to do. Time was spent researching ideas and developing them into a product. It was only on the second day that the pupils were informed that the rest of the school, albeit only S1-3, were to be their audience and judges. Each team put on a presentation outlining the merits of their products and the younger pupils voted for the product they would mostly likely buy. The winning team, consisting of Gabriel (team leader), Olivia, Alexander, Rosie, Anju and Andrew, created an all-in-one mattress, sleeping bag and tent; this proved far more popular than a device for helping to bury human waste, an integrated GPS, clock, thermometer and torch, and a clothes pony (as opposed to a clothes horse). All participants are to be congratulated on the way they approached and accomplished this task. Triathlon – The school held its first triathlon on Friday 18th June. Centred on the harbour and Flowerdale, ten mixed teams of three kayaked, ran and mountain biked over a hard course. Much to their relief the teachers came home first in 41’30”. The first pupil team home in a total time of 42’02” was Jake Bulmer (kayak), Kim Watson (run) and Alasdair MacLennan (bike). As an inter-house event, Maree came first, followed by Kerry and then Tollaidh. It was good to see so many young people competing hard and putting in 100% effort. Click here to see photos of the event or here for a slideshow. Thanks to Gairloch Boat Club and Torridon MRT for helping with safety cover, Hands On Events and Square Wheels bikes (Strathpeffer) for sponsoring prizes and Gairloch estate for allowing the use of their land. The entire event was conceived, organised and marshalled by S4 Skills for Work pupils. Visitors from Malawi – In August, shortly after the start of the new term, we anticipate that two teachers from our Link School in Malawi will be visiting Gairloch for about 2 weeks; the Head Teacher, Mr Winnex Chimtali, and the Depute, Miss Sarah Ajawa. This opportunity follows our successful application for a Global School Partnerships grant for reciprocal visits and other fund raising. The purpose of the visit is to develop the link between our schools by enabling us to discuss, plan and initiate joint work with a global theme. It is also an opportunity for our pupils to learn more about life in a developing country and for us to engage in professional dialogue with our colleagues. Our visitors will be spending a large proportion of their time in the High School, but will also visit some or all of the Primary Schools. During the visit, we are planning a community ceilidh to give them a real Scottish welcome to Wester Ross. This will be in Gairloch Community Hall on the evening of Saturday 28th August (after the Gairloch Show) and is intended to provide an opportunity for pupils, staff, parents and other members of the community to meet socially with our visitors. They will also be meeting with some community groups. Already, the ATC, the Youth Football Club and others have expressed interest. If any other community groups would like to meet with our visitors, please get in touch with Dr Caley at the school. Prefects – Interviews have taken place and prefect ties issued. Pupils have to agree to take on a series of responsibilities and we wish them all luck in living up to the challenge asked of them in setting an example. A number of pupils are asked to form a team of senior prefects with additional responsibilities. Head Boy & Girl – James Staddon, Katrina Port. Deputes – Jade Watson, Rhoda Tippett & Alasdair Paul. Details of Senior House Prefects will be in the next issue. Prize Giving is on Wednesday 30th June at 1.30pm in the School. This year we have a special guest, Mrs Janet Bowen, Her Majesty’s Lord-Lieutenant for Ross and Cromarty. Parents and guests are welcome to attend this ceremony. School closes for the holidays at 1.30pm, Friday the 2nd July. The next issue of the G&DTimes will include names of the awards and prize-winners from Sports Day and Prize Giving. 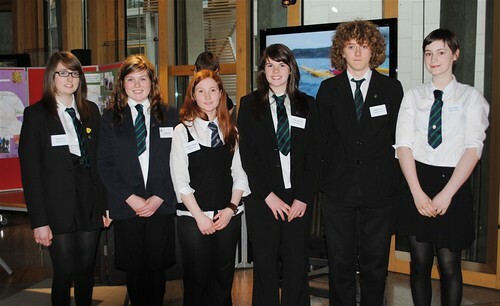 Gairloch High pupils at Scottish Parliament Reception – The reception was attended by Roxanne Ramsey, Katrina Port, Ella McDonagh, Alasdair Paul, Anna Hulme and Kirsty Alexander along with Dr Caley and Mr Port. Read more about the invitation below. S1 Welcome Pack for new pupils – On Wednesday 26th May, S1 took part in an enterprise day. The purpose of the day was to work in small groups to make stickers, bookmarks and a booklet about the school which could be used in a welcome pack for the new S1’s. They were supported by Dr Caley, Ms Leitch and Mrs Whall. At the end of the day each group presented their packs for judging with a selection of teachers deciding on the best items. P7 Expressive Arts Day – Friday 21st May saw the return of our successful Expressive Arts Day. Pupils in P7 spent the day working with Ms Gulliver (Art), Mrs Hildrey (PE) and Ms Hunter (Music). The theme this year was “Weather”, and pupils were split into groups depicting ‘Sunshine’ and ‘Rain’; they made their own masks and decorations, as well as learning movement and drum rhythms. A great time was had by all, and the final performance was enjoyed by S1 at the end of the day. Click here to see some photos. S3 Biology: Shore Thing project – The Shore Thing project is is a long term survey run by the Marine Biological Association looking at the effects of rising sea temperatures on marine life. Thanks to Chris Barratt (Rua Reidh lighthouse), Fiona Crouch (Marine Biological Association) and Nicola Tallach (Scottish Natural Heritage) for their help, especially with naming the more obscure seaweeds! Click here for some photos. DofE Bronze – The practice expeditions for the S3 pupils working towards their bronze award took place on 24th and 25th May. Two groups, accompanied by Miss Dean and Dr Caley, started from Red Stable and walked up to Poca Buidhe where they camped for the night just beyond the bothy. They walked back the next day after some training activities. Meanwhile, the other two groups set off from Shieldaig Lodge, accompanied by Mrs Johnston and Miss MacAllister, and walked up to Loch a’ Bhealaich where they camped on the beach, also returning the next day. These were some of the coldest practice expeditions in recent years, with the wind in the north and some showers turning to snow at Poca Buidhe. However, all groups made good progress towards the qualifying expeditions which will take place on 21st and 22nd June. Click here for some photos. S4 Enterprise – Harbour Lights have kindly donated their ex – hire bikes to the school. Four S4 boys spent two of the enterprise days working on them. The smaller bikes will be used for younger pupils in the school and the very small bikes have been passed on to Gairloch nursery. Thanks to Lewis Martin for coming in to help out. Click here for some photos. A group of S4 pupils opted to spend a day doing landscape painting as part of their Enterprise Week. The pupils ranged from those that had just completed their Standard Grade course to those who had left the department at the end of S2! Some good results were achieved and these are to be displayed in the school for the next while. Other events included Drama, building a spaceship in the library and Junior Apprentice. Reports on these are available here. Art in the High School – The second Art display in the High School over the last couple of weeks involved exhibited Design course work by S4 Standard Grade pupils. Their task had been to design display stands and packaging for a range of different companies. Their research work and the development of their ideas was on show as well as their final prototypes. This work can currently be seen on the school website by clicking here. Practice-a-Thon – Last term, interested music pupils in the High School and Gairloch Primary School were encouraged to take part in a sponsored practice, called Practice-a-Thon, which raises money for Clic Sargent, the children’s cancer charity. With only a few more contributions to be collected, the present total raised is £1,171.81. This is a very impressive amount, and we pass on a loud WELL DONE! to all the children who took part are to be commended for their efforts. Could we ask all “latecomers” to try to get their monies into school as soon as possible, please? Musical Showcase 2010 – Thursday 24th June, 7.30pm Please put this date in your diaries, and come along on the night to hear pupils perform the music which they have worked hard to produce in 2010. A fine and varied selection of music will be on show – fiddles, pipes, clarsachs, whistles, pianos, voices and much more! We look forward to seeing you there. VACANCY – We have a vacancy for a Learning Support Auxiliary beginning in August 2010. 22 hours per week, £8787 – £9903 p.a. Closing date Friday 25th June 2010. Contact the Headteacher for details. DofE Scotland celebrated the success of its Curriculum for Excellence pilot project at the Scottish Parliament on Wednesday 2nd June, with young people showcasing their DofE activities from around the country. The reception was hosted by MSP Adam Ingram and was attended by Cabinet Secretary for Education and Lifelong Learning, Mike Russell, representative staff and DofE participants from Preston Lodge High School (East Lothian), Dornoch Academy and Gairloch High School (Highland Council), Carrick Academy, Queen Margaret Academy and Y Dance (South Ayrshire), and other MSPs and DofE leaders and volunteers. The reception was attended by representatives of the school: GOLD candidate Roxanne Ramsey, SILVER participants Katrina Port, Ella McDonagh, Alasdair Paul, Anna Hulme and Kirsty Alexander along with Dr Caley and Mr Port. The final report published by the DofE is available online here. Our pupils showed via poster and film the range of activities that we use in the school to support DofE. They talked confidently about their experiences while volunteering, learning new skills and on expedition. They were reminded by ministers how lucky they are to have the chance to do the Award in school. A very small percentage of schools offer the chance. Gairloch was selected for the pilot because we actively encourage all pupils to start the award in S3. This would not be possible, of course, without the support of staff and parents alongside members of the community who provide time and knowledge for the benefit of the pupils.